Why Would You NOT Use a Grid?? Lynn gave me the great idea….She said “Somehow people need to have an “aha moment” about grids. An ‘Ohhhhhh! I get it now’ experience. Sometimes you just need a gimmick to get people’s attention and get ’em thinking. A Square Foot Garden without a grid is like. . .
Grids are like children. Vegetables are like teenagers: they want their OWN rooms. They’re happier, healthier, and more cooperative. If you won’t do it for yourself, DO IT FOR YOUR BROCCOLI! If you have a catchy, fun grid comparison…post it below or email it to askmelsfg@gmail.com. Include a picture of you and your gridded SFG if possible, and I will post it on my Facebook page. Happy Gardening! John Wheeler, PA: is like a wall full of paintings without frames. Survival Gardener: is like a Brit without braces. Robby, Iowa: is like a cup of hot chocolate without marshmallows. Gunny, AZ: is like a drill without bits. Dan Lakey, Arkansas: is like a house without any interior walls. Mel in CA: is like a birthday cake without candles. James Vinson, AR: is like a spreadsheet without a grid. Jeannette, CA: is like most breasts without bras. All over the place. Jeryl, Nevada: is like making a salad without knowing what I have in the bowl. Mel in CA: is like a Christmas Tree without lights! A Square Foot Garden without a grid is like a wall full of paintings without frames. Great! Ha Thanks for sharing John! John, I just thought of one similar to yours. That would be: A Wall Full of Frames with No Paintings. What do you think? Can you build on that :)? Sides done on my bed but what or how do i Mark out my Squares? Ok! A grid it is. One problem….where can I find the little connectors? I have looked in several home improvement stores and will be heading to hobby shops but would love some guidance. We order these pins that snap together in a bag of 1,000 each so they are obviously not available to an individual. However, let’s use our imagination to think together to think what else we could use to connect your grid at each intersection. First, how thick are your grids that you are using? If they are used venetian blinds and you are recycling them, you can drill a whole at each 12 inch point and use a brass library pin that looks sort of like a cotter pin. 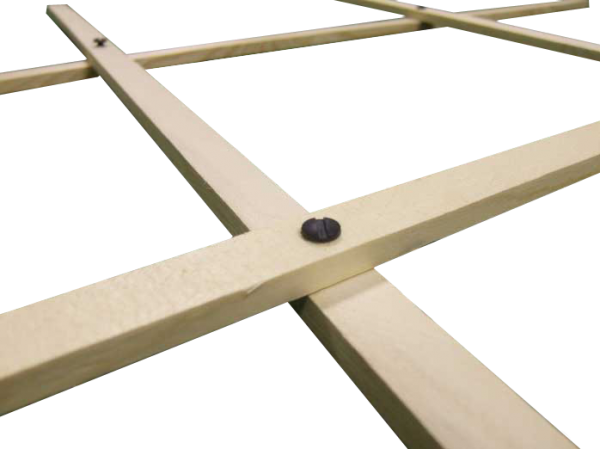 Or you could use a very small nut and bolt for any thickness of the grids. I once used the venetian blind idea but the wind kept blowing them up and away. Instead of a small connector I pushed a large, heavy nail through each intersection down into the soil and that weighted the whole grid down so it wouldn’t blow away. First drill your holes at the 12 inch intersections and then I think if you took your grids to a hobby shop or hardware store I’ll bet they could find the perfect pin in just a few minutes. My “fix” for my problem was the simple 3/4″ Hex/washer head screws. I have an odd-sized raised garden (84″x42″x6″) on top of cinder blocks that has a divider board in the middle. So, my “squares” are approx. 13.5″ instead of 12″. I have 3squares by 6 squares!! I made 2 sets of grids for each of my four gardens and painted each a different pastel color. My frames (made from 1″ PVC) for trellises, shade and heat block are also painted their respective colors. Almost complete….hopefully by the end of April. Am harvesting strawberries and Swiss chard as we speak! When I go to my home away from home (Lowes)…I promote your soil!!!! Would love to become a certified gardener and help others find their green thumb. Our renters have done just that! She got the “fever”! A Square Foot Garden without a grid is like a Brit without braces. Oh I like the brit without braces. Since I’m English by decent on my father’s side, I can appreciate that very much. Good selection, David! New to the website but want to add to the conversation, which is appropriate for this time of year….A SFG without grids is like a cup of hot chocolate without marshmellows. This is the best description of a garden without a grid that I have heard. Hot chocolate without marshmallows. I have to confess though because every morning I start with hot chocolate with marshmallows and in the afternoon switch to hot tea. I like the image of the hot chocolate. Thanks for sending this in! I agree, except for the Hyundai put-down. Unless they’re now making BMWs with a hatchback! A sfg without grids is like a drill without bits. Excellent comparison. We’re really getting some good ones and I’m going to post all of them so we can read/write straight down and we’ll include yours. You raise a good point: without a bit, what good is a drill? When we ask people that have a box garden and they say they are using the SFG method but then admit they don’t have a grid, their answer is “Oh we don’t really need it, we can visualize the space” but then we look at thier garden and its a mess, mish-mash AND a mis-match (say that three times real fast!) So it points out the need for all of the parts, and certainly the grid is the most important part. In fact, here is what’s happening in the commercial world. We are getting many imitators and copycats who want to cash in on the SFG method. But they know, of course, not to call it SFG, because we have not only a copyright on the word and method, but also they don’t want to put a grid on because that is the most outstanding feature and advantage of using the SFG method. The best possible comparison would be a house without any interior walls. The living rooms runs into the kitchen, which runs into the bedroom, which runs into the bathroom. An open floor plan is one thing, but com’on, there is definitely a certain usefulness to walls. A grid can be made with string, yes? Where did you ever read or hear that you could use string? Let me give you a little history: the original book, 1981, that was 30 years ago, said you could use string to make your grids. But then we found out that string sags, gets dirty, breaks easily, and just doesn’t look very good. So the ALL NEW book (2007) said, DO NOT USE STRING! We have found that people that do use string, as soon as it breaks or gets dirty, don’t replace it and then they don’t really have a Square Foot Garden. Believe it or not, they actually start planting rows in thier Square Foot box. Do not be one of those people or we will come and get you. Hope that helps and gets you on the right track. Good luck with your garden. Some of us still have the old SFG book. I felt blessed to find a copy in a thrift store, around the time the new (2007) edition came out. So, yes, some of us have read in your book that string can be used to make grids. Frankly, I didn’t bother with grids when I planted my garden, and had no problem sticking to square feet. I read what you said and went into shock, because I want to tell you: you’re missing all the best features of SFG when you don’t have a grid. Yes, you can get by without a grid. But let me tell you a story and a comparison with something else. First, let me tell you all the advantages of having a grid. First, since it sits there and you choose that square, you know exactly where and how much you are going to plant. Remember the 1, 4, 9 or 16 plants per square foot. That’s going to tell you the harvest. I tell people if they’re going to plant more than one square of radishes a week, they are going to have to harvest 16 radishes a week and thats a lot of heartburn. The next thing that the grid does for you is it separates your plants nicely so the tall plants can be to the north side and not shade the shorter varieties. It also gives you a border, or another way to look at it, a picture frame, around each little garden. There is no other garden like a Square Foot garden and if you don’t show it off, with a grid, you’re missing an opportunity. When you think about other products, like a car, some manufacturers have very distinct features on thier cars and other people get to know that it’s special. There’s also a very practical method with the grid. Remember I was an engineer and efficiency expert. I want to get the most out of the least amount of ground possible, so I want the garden to be efficient and that means no wasted space. I want you to imagine, way back in history, when one of the first big box stores, like walmart, moved out into the suburbs, bought a couple acres of inexpensive property, put up thier building, and had the contractor pave the big parking lot all around the store. Both the designer and contractor didn’t paint any parking lines, so except for an entrance driveway, there was no indication of where to park and leaving room for others. If you could picture that, you would know that everyone that came at first just parked nilly-willy and as close to the building as possible, but then just left their car and walked away. What a mess. What a madhouse. Cars were turned and left every which way and pretty soon, it was so crowded, people couldn’t get out. That made it even worse. They called in the design engineer and said, “What can we do?” He said, we need to lay down a grid so theres a division between where they should drive and where they should park and we’ll divide it up into spaces so we can fit the most cars with the least amount of waste and it would be a very efficient way to drive in and out, as well as parking thier cars. Now take that same idea and think of a highway without lanes painted. If its 3 or 4 lengths wide, think of the confusion of who belongs where and how many accidents and horn beeping there would be. Even beyond that, I like to look upon our grids as something really outstanding. It indicates right away this garden is special. This garden is different. This garden is organized. I’ll bet the person that owns this garden is really happy with their production. I’m hoping that will convince you to add a grid and you’re actually right, the original book did say strings were okay. But, like many things, we kept improving the system. Especially when we saw that the string would sag, get dirty, break, the nails would get rusty and people wouldn’t replace it and end up with a halfway or non-grided, non-descriptive raised garden beds. Some people have begun to paint them using a water-based paint and of course white stands out terrific, but even pastel colors look quite nice. Painting is particularly attractive when you have children. They really love thier garden when they themselves can paint the grid. It can be just one solid color. Each grid could be a different color, criss-crossing, and they could even paint little designs in the grid, or to the outside of the box. Hope that helps encourage you, so you won’t have to apologize to visitors as to why you don’t have a grid. Hope that gives you some ideas and please let me know what you decide to do. You wouldn’t want a spreadsheet without a grid either and for the same reasons. It’s makes everything crisp and organized at a glance. Keep thinking and thanks for your letter. That is a terrific response and certainly appropriate for all those who use a computer. I think I’m going to use your letter to collect all of the submitted comparisons so we can see them all together. New to SFG and had to jump in with no grid is like most breasts without bras. All over the place. My husband wanted to know what was wrong with the no bra. Hello Jeannette from California. Why you’ve come up with about the most unusual vision of a garden without a grid! And I can see your husband has a very good sense of humor, but you better tell him to stay in the house while you’re working outside in the garden. Now remember, it’s never too late to add a grid. And if you had to get started without one…why was that? It only takes a couple of sticks. If you want to use wood – two ways: One is you go on our website (www.squarefootgardening.com) and order a set of wood to match whatever number of boxes you have. They come all complete with the little pins and you just snap them together and you’ve got your grid and you lay it down. Or you could go to a lumber company and get what they call “lath” and believe it or not they are sticks of wood that are 4 feet long. They’re about an inch wide and they’re thin (about 3/8 of an inch) and they make perfect grids. They’re a little rougher wood because of the way they are sawed but they should work just fine – drill the wholes every 12 inches and put in a nut and a bolt or one of those library pins that ends like a cotter pin. So thanks again for your comparison. We’re going to add you to the Master List. Quite often we ask people to send us pictures but maybe in this case we won’t. Just a little humor there…. I have a diagram (on grid paper) of what was planted where. With my chart of companion planting, I can plan ahead and get the right plants in the right places so there are no conflicts. The frames for trellises will match my colored grids. Frankly, I would be lost without the grids. It would be like making a salad without knowing what I have in the bowl!